Rocco and his pal Nicky are both Havanese but they still learn very differently. Read on to learn how to get a FREE Dognition assessment with fun, science-based cognitive games to learn more about how your dog learns. This post and giveaway is sponsored and fulfilled by Purina Pro Plan. 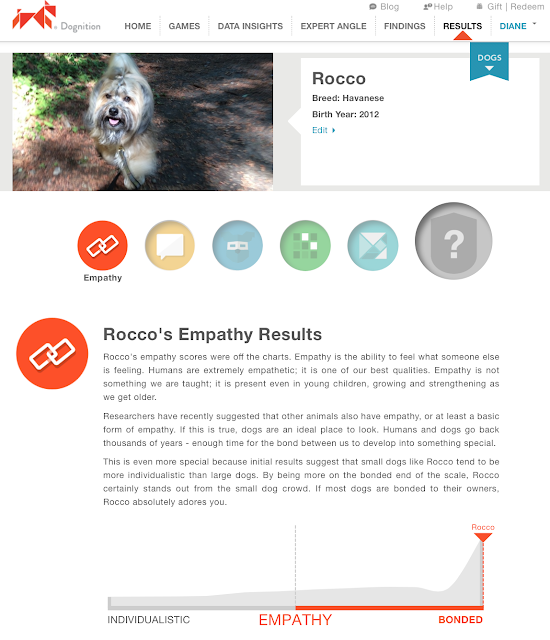 Are you interested in learning more about your dog's cognitive style? If so, you're not alone. In a recent survey conducted by Purina Pro Plan BRIGHT MIND, 9 out of 10 respondents feel they know at least a little bit about the way their dog thinks, learns and problem solves and 86 percent are interested in learning more. But what happens to cognition when we age? Most people are aware that cognitive abilities may decline as humans get older, but did you know the same holds true for dogs? According to the survey findings, there’s a gap in knowledge among dog owners on topics related to brain health and healthy aging. While dog owners say that brain health is one of the most important aspects of their dog’s health, only 30 percent were aware that as dogs age, the glucose metabolism in their brain changes, potentially leading to changes in behavior. 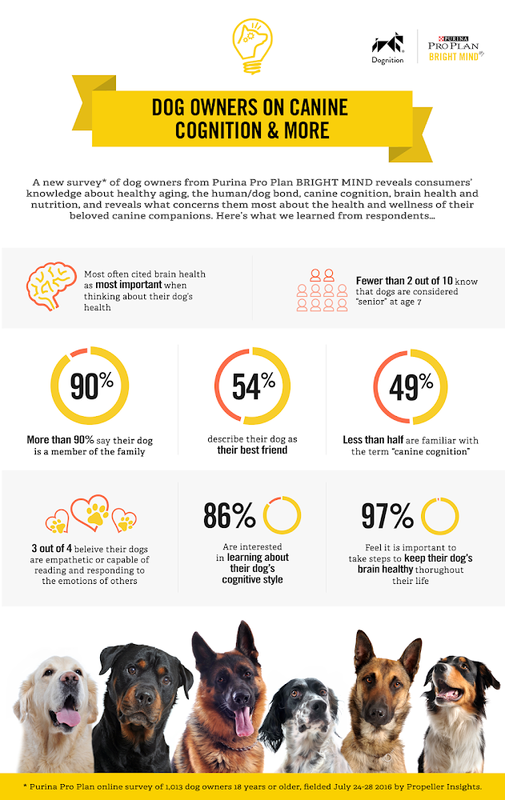 Take a look at some of the other survey results here, and then be sure to read all the way down for some great info -- and a giveaway -- to help you learn more about your dog's brain health and the way they think. Is Your Dog’s Food Feeding Your Dog’s Brain? Purina Pro Plan discovered a way to help promote brain health through nutrition, introducing Purina Pro Plan BRIGHT MIND® Adult and Adult 7+ dry formulas that feature a proprietary blend of brain-supporting nutrients for adult and senior dogs seven and older. Around age seven, the glucose metabolism in a dog’s brain begins to change, which can affect memory, learning, awareness or decision making. Purina Pro Plan BRIGHT MIND Adult 7+ formulas feature enhanced botanical oils shown to promote alertness and mental sharpness in dogs seven and older to naturally nourish their minds and help them think more like they did when they were younger. This year, Purina Pro Plan is partnering with Dognition, an innovative online platform that offers fun, science-based games that reveal the unique way each dog sees the world. The partnership pairs the breakthrough innovation in Purina Pro Plan BRIGHT MIND formulas with Dognition’s unique cognitive assessment tool to help dog owners gain a better understanding of dog cognition and the important role nutrition plays in dog brain health. As part of the partnership, starting this month, purchase any specially-marked bag of Purina Pro Plan BRIGHT MIND dry dog food to receive an exclusive access code inside for a FREE Dognition® Assessment, a $19 value, while supplies last. Visit www.dognition.com/brightmind to learn more and play select Dognition games for free. Purina Pro Plan BRIGHT MIND formulas are available at pet specialty retailers nationwide and on Amazon.com. For more information, visit www.BRIGHTMINDEFFECT.com. Win a FREE Dognition Assessment Right Now! Enter via the giveaway widget at the bottom of this post for a chance to win a FREE Dognition Assessment. We have FIVE codes to give away, so enter now for your chance to win one for you and your pup! We've already played a few of the games and it's fascinating to see how Rocco responds. We can't wait to finish them all! Here's a look at the results of his first set of games in the Empathy category. Remember, you can check out all the games at www.dognition.com/brightmind and there are a few games available to play for free right now! In the meantime, enter below for a chance to win one of FIVE free Dognition Assessements. 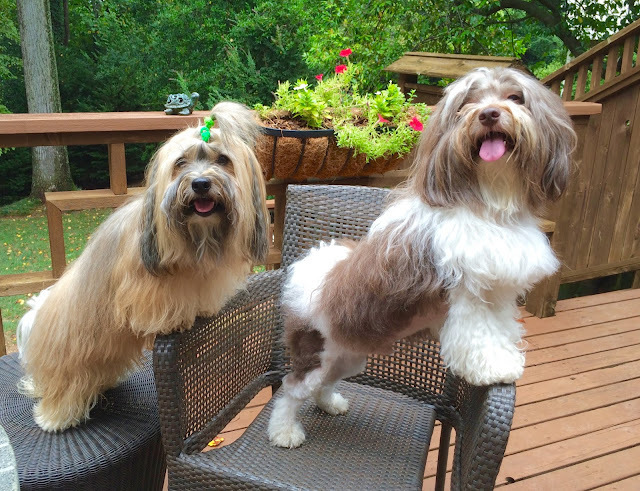 What a thoughtful and interesting post, Diane and Rocco—we learned a lot and plan to enter! Thanks! My dog knows when I say are you ready and she goes to the door. she does it every time. she is really smart. My dog loves to take himself swimming in the pool, and can climb out wherever he is, even though he's not a big guy. The smartest thing Jake, our malamute, does is NOT eat the ferret he found one night (an escapee from somewhere, we can't find the owner). He outweighs the little guy by a hundred pounds and slightly injured him on a mad chase through the yard InTheBeginningOfThisOrdeal, but somehow they have made friends. That's pretty smart, I think, considering his every instinct says FOOD. All the agility training we do takes a lot of intelligence on their part. We do disc dog competition so all the freestyle moves that Drago knows are amazing. When Bella was younger she would figure out how to get on a table and open the blinds to get into the main room of the house. She is a smart girl! When Kronos was a pup he figured out how to scale the puppy pen-he wouldn't let that contain him! Terra has learned to turn her upside down bowl the right way to grab it and bring it back. Fenris can let me know where the cats are when I ask, he will also go get objects like balls when I tell him too. And apparently he can read signs because when we were walking on the beach and I left him in the care of my friend Tammy briefly they were standing next to a sign saying that dogs must be on a leash at all times. She dropped the leash when she started talking to someone and he picked it up and kept trying to give it to her. my oldest dog who is now almost 15 and has a little dementia, was the smartest girl b4 she developed dementia. she was always such a quick learner, potty trained in abt 2 wks, learned how to play soccer and kickball by herself. she always loved playing with balls, and just picked up how to kick the ball and travel with it with her front legs. she learned tricks very fast. when she would chase the deer out of her yard, she knew only to chase them to the edge of my property. i still have not figured out how she knew where the lines where, but somehow she knew only to go so far which is hard when i live on over 11 acres. when we used to visit my mother in the assistant living facility, she knew exactly what room my mother was in, she would go up the stairs and straight to her room and scratch on the door til my mother opened the door. my first schnauzer was so smart as well. when i would come home late at night, i was now living in a different state but Rose had become my parent's first grandchild, she somehow knew i was coming home. she would be in the window on the top floor looking at me when i drove up and barking at the door. my middle child has learned to open the front door, she has not learned how to close it yet but some how she learned how to open it. my dog learned how to open the lock on her crate. One of my dogs has a great sniffer. He can smell anything you put out for him to find. افضل شركة تنظيف لمميزات عاليت الجودة بأحدث اجهزة التنظيف والمستحضرات الطبيه والتجميل والنظافة. When I hide treats my pup can always find them. My Miniature Wire-haired Dachshund has learned if she wants to get inside quickly, I must see her do a pee. A crack of thunder will make her get to business, LOL! He understands that he is not allowed on the bed except when mom has a migraine and dad is gone. The dognition should be understood by the owner of the dog to get some tips on how their dogs are moving and what they can try to understand you.The http://www.procustomwriting.com/custom-term-papers is consireded as one of the best solution for them, beside a lot of services are available in the current market place.I see the bright future of this dog training based company. كشف تسربات المياه بالمدينة المنورة متميزة و ذات جودة عالية كما ان اسعار خدمات الكشف و المعالجة التي تقدمها شركة تسربات المياه و لذا فاننا نعتبر من حيث الاسعار ارخص كشف تسربات المياه بدون تكسير و من حيث جودة الخدمة افضل شركة تعمل في هذا المجال الدقيق و المتخصص و الفني لا تتردد في التعامل مع شركة تسرب المياه التي تسهل و توفر عليكم الوقت و المجهود و المال كما انها تقدم خدمة متميزة ايضا نحن دائما نسعد بتلبية جميع رغباتكم و نتشرف بخدمتك دائما.